Somewhere in the great ocean, lies and island that is not present on any map. Its inhabitants are those who first accidentally stumbled upon its shores. And they have called it their home ever since, all the while making sure that no one else is to enter the island and ruin their way of life. "new land seekers" in service to a greedy king. 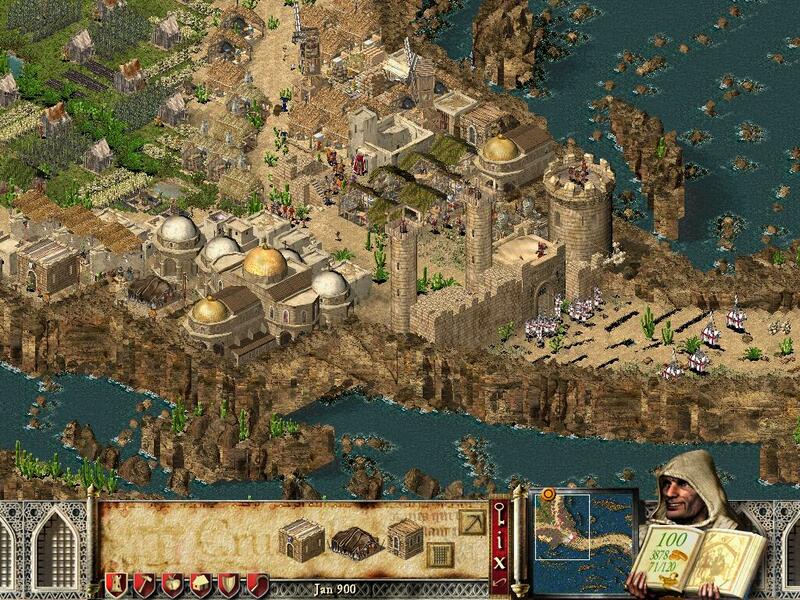 that king has now sent masses of his imperial army to come and claim this island to be a part of his kingdom. It mow falls into the hands of the settlers of the hidden island to defend their home. 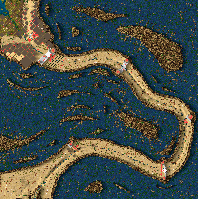 The path to the island is an unnatural valley between the waves of the ocean, the settlers have already built some sort of fortifications but it will take great courage and immaculate planning to be able to hold off the king's armies. This looks like a pretty cool map. I'll give it a try. There isn't a lot to do in this map, and it has some basic problems. Unless you open up paths through your front two wall layers, the enemy will not attack you, rather they will stand by the sign post. One of the knights you start with is stuck on a rock and can't move. Your city is already built and will fulfill your needs almost unaltered. The action occurs in the long snake-shaped section of land, where strings of soldiers will march toward you. After you have a sufficient number of archers and crossbowmen, there isn't much to do aside from wait. I never felt seriously threatened in this map. In the beginning I had ample supplies of pitch to burn my enemies with, later the large sums of gold you can raise enabled me to just buy all the weapons and soldiers that I needed. I held the enemy at bay at the second layer of wall for almost all the scenario. Later I sent archers out to harass the swordsmen as they marched toward my castle. The city and the landscape are fairly unique. I like the idea of a weird passage which is below sea level. The best thing about this map is it's very nice-looking. The sweeping curves of the rocks and cliffs in the sea are very attractive, and the author has put work into making the little creek flowing into the pond look peaceful and relaxing. I kind of like how the pitch rigs were done, I don't think I've seen them made that way before. Not much to say about the story, it does its job pretty well. Nice map to look at! Unfortunately I think Crusader's AI isn't doing you any favors here, if the attacks didn't send small groups of soldiers one at a time this map might be more challenging.